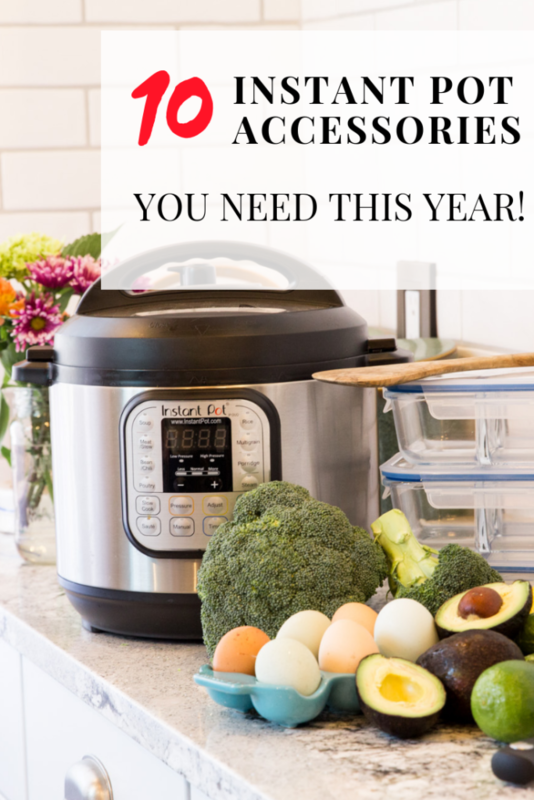 INSTANT POT ACCESSORIES – THE MUST HAVES! 10 MUST HAVE Instant Pot Accessories. Today is the day most of us wait to buy all of our Christmas gifts (some birthday gifts too!). For good reason! I don’t know about you, but I’m thrifty and like to save as much money as possible. Why spend more money when you don’t have to. Today I’m going to be sharing with you my favorite Instant Pot Accessories! Let’s talk about Instant Pot’s first. I have 2. I have the Instant Pot DUO 6 Qt 7-in-1 that has the yogurt function (which I never use LOL). I typically just cook everything on manual or the slow cooker function. This size is great for making sides like riced cauliflower, broccoli mash, and date night dinners. Right now this Instant Pot is on sale for $54.49 (usually $99.95), snag it while you can because the prices are sure to change and they are known to sell out quickly. I also have the Instant Pot DUO 8 Qt 7-in-1, which I too use manual function for everything. This bigger Instant Pot is perfect for making large batches of bone broth, Mississippi pot roast, low carb cheesecake, soups and much more. Right now this Instant Pot is on sale for $104.95 (usually $139.95), snag it while you can because the prices are sure to change and they are known to sell out quickly. Multiple sizes is a plus! If you have a shorter trivet and a taller trivet you can do pot in pot recipes. This is perfect for if you only have 1 Instant Pot but you want to cook multiple foods at once! Here are the trivets for the Instant Pot that I have. This is the shorter trivet I have. I don’t use this to cook eggs with, rather instead I use it to put glass bowls on top of, ribs, or foods wrapped in foil. This is the taller trivet I have. It’s perfect for cooking food underneath and then setting a bowl or other food on top to cook at the same time! This silicone steamer basket may be my favorite instant pot accessory! I literally use it for almost everything! I used it today to steam cauliflower to make my loaded cauliflower mash. Yesterday I used it to make Instant Pot hard boiled eggs. I’ve used it to cook Instant Pot Beef Ribs before too! Also it cleans so much easier then stainless steel steamer baskets too! Did you love Starbuck’s sous vide egg bites but hate the cost? We found a way around that by making our own sous vide egg bites in the Instant Pot! We share our favorite recipe in our keto instant pot ebook that is on sale over on Amazon. Why would you need silicone rubber bands? You place these bands over glass containers and easily lower them into the instant pot and onto your trivet. They’re also great to easily remove foods from the instant pot without the fear of spilling the contents of your container. Do you use the sauté function on your Instant Pot a lot? If you do then you need this Instant Pot Glass lid! It totally enhances the sauté function! Do you make a bunch of sweet dishes in your Instant Pot like my Low Carb Instant Pot Cheesecake or our Low Carb Flourless Chocolate Cake? Then you need extra Instant Pot Sealing rings! Push Pans are perfect for making keto instant pot desserts and low carb casseroles in your instant pot. We just made this Low Carb Green Bean Casserole for Thanksgiving in our Instant Pot! Place one of the silicone rubber bands (#4 above) around the push pans to make removal even easier! Like the name states, these pans are great for making cheesecakes in the instant pot, pot they’re also great for making meatloaf, egg loafs and other low carb casseroles. If you have a 6 Qt Instant Pot, make sure to not get larger than a 7 inch pan! Why might you want an extra Stainless Steel Inner Cooking Pot? That’s easy! For someone who uses her Instant Pot to do a lot of meal prep, by having 2 inner cooking pots you can start to prep your next meal while your first one is cooking. If you accidentally get burnt on food you can soak the first one while you cook with the other. Or your can store leftovers in one while you cook with the other. Whenever I’m super lazy and don’t feel like transferring my food (once it’s cooled of course) to separate containers, it’s super handy to have these silicone lids for the instant pot so you can just pop the entire pot into the fridge. Im new to this Instant Pot so I’m not familiar on how to use it. I’m very interested in more info if you have it.